"I believe the Curtis cover (Vanishing Illusions) is a homerun. Super compelling." "The Curtis cover graphic grabs you immediately." "I think Curtis would have a broader appeal." "What a difficult choice! I love both. I don't know the story of the Power brothers and feel that the Curtis cover may have more universal appeal." "For me, long shots are not as interesting as faces and close ups. So I think cover #2 (The Power of Redemption) is stronger." "Both are great covers. I love the artistic nature of the Curtis cover but my gut tells me the Power cover would have more newsstand appeal." "I am obviously prejudiced in favor of outlaws and lawmen, but I vote for the Power shootout. I think that will really grab anyone at the newsstand." "As much as I like Curtiss work, I prefer the redemption photo for our cover." "I like the Curtis cover better, but the Power cover is eye-grabbing and makes you wonder what the story is. I think that's your newsstand cover." "The Power of Redemption cover has imperative. The Curtis cover is passive." "Redemption looks like it would grab more attention on the newsstand, and I say that in spite of how much I love Curtis' work." "It looks to me like the Power cover has it." On the day we went to press—about ten days ago—we had one final, spirited debate about the pros and cons on the covers and it mirrored pretty closely to the comments, above. In the end, however, when we broke it down, everyone agreed we had made the right call. If you are a subscriber, you will know within the next 48 hours which cover we went with. 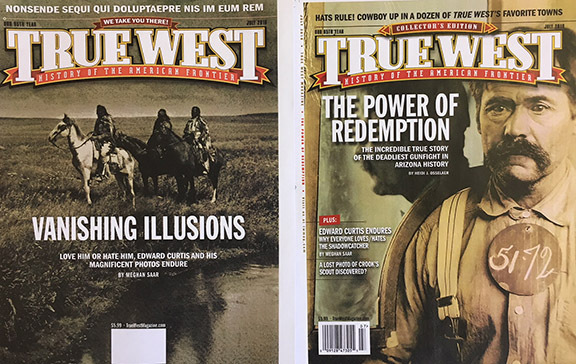 If you buy True West off the newsstand you will have to wait another week, and if you are slumming here for free, and have no intention of buying the issue, I'm not going to tell you. Ever. "Everything may, in fact, want to be free, as they say, but that's not how you pay the bills."